A few of my students have been asking about pole dance gradings so I thought I could use today's blog to tell you a little bit more about the Advancement and Accreditation Programme (AAP) run by the Pole Dance Community and available to you at the art of dance and through any other PDC approved instructor/school. The AAP gives students the chance to get international recognition for their pole dancing progress and gives them a way to chart their pole dancing progress as well as being able to share their success by showing friends and family their achievements. The grading process is simple; a student who is thinking about grading should peruse the Pole Dance Community Syllabus and see which pole dance moves they are working on and which level of the syllabus those moves relate to. Once a student has established which level they are at they can then select their best 5 moves from the preferred level. I recommend chatting to your instructor to help you decide which moves are your best, that way your instructor can help you revise those moves during class time so that you can execute them perfectly on the day of your grading to guarantee success. So, once you have decided on your 5 moves you can book your grading with your instructor. You need to have your AAP membership (costs £30 annually) and then you need to pay for your grading. 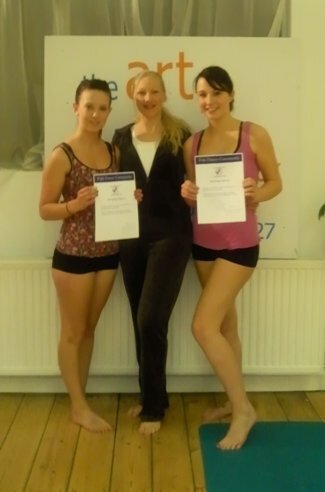 At the art of dance we charge £15 per grading and this includes your certificate on successful completion. Our next grading day will be held on Saturday 25th March. You may find the following videos helpful in learning more about how the grading works. Emily Smith from Emily's Pole Fitness doing a beautiful Level 1 pole dancing routine. 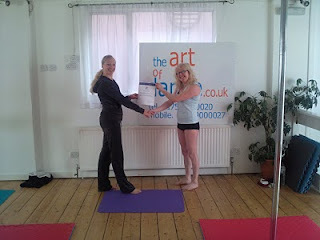 Emma Thorpe from the art of dance doing her Level 4 pole dance grading. You can also download the grading sheets and notes from the Pole Dance Community website's AAP page. Their is more to the AAP membership than just grading, you can record your pole dance competition success, record which pole dance schools you have attended, log courses and work-shops and you get free personal accident cover if training with a PDC approved pole dance school/instructor. I can't wait to see the next group of students receiving their certificates. I must also send big congratulations to Charlie Picton, Sabrina Plumb and Bo Dickens from PDC approved pole dance school Princess K who all successfully graded at level 1 last week. If you need any more information on pole dance gradings simply contact your nearest PDC approved pole dance school.